I love you Tango. I miss you so much. I can tell the other horses miss you too, especially Peppy. I went to see him today and he acted so different. I walked him by your stall and he nickered so soft. When you didn't answer he wouldn't move. We both miss you sweet horse. Have fun up there in those lush green pastures galloping around like a young colt. I will miss you so much. Goodbye and I love you. Just keeping up the poems to remember you, buddy. It hurts writing them but it also brings a smile to face! Me and Peppy miss you! We'll see you again one day Tango. Have fun in God's pastures! Just a note for you gals--Tango was put to sleep because he had developed founder from grazing. There was no way to fix it so that is why I wrote the mini poem above. Now, he can graze again after none for 6 months straight. Goodbye--it's a common word everyone hears nearly everyday. Recently, one of my favorite horses, Tango, was euthanized after he developed and dealt with founder for nearly six months. It broke my heart and I still find myself crying at night. The day I was told the horrible news I was riding home from the barn. I had just told my Mom what happened whilst sobbing my heart out. I remember these few words I said before we pulled into the driveway, "I never even got to say goodbye." But really, why is the word "Good" in "Goodbye"? Just this morning, I was thinking about it as I was looking at old photos and videos of Tango. I wanted to write and post something about this on HCG when it hit me. Goodbye is more like see you later. I started to think. Maybe the good part about goodbye is knowing you will see them again one day, keeping that one thought and one hope in your heart that someday you will see them again. But there is only one way to see them again--by knowing God and his word, to confess your sins to him and ask for forgiveness. I know reading the bible these last couple weeks has really helped me with losing Tango. So maybe goodbye isn't such a sad word. So next time, instead of saying goodbye, say see you later. I thought I was doing better after losing Tango but I realized a moment ago that I'm not. I just have been doing things that kept him off my mind then a few minutes ago I just lost it. I miss him so much more than I ever imagined. I never knew how much I loved him until he was gone. I love you Tango. 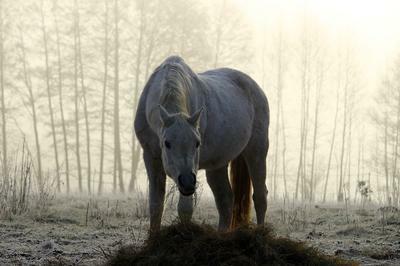 by: Horses Rock This World!!!!!! You are so good at poetry! I'm so sorry for your loss. My dog was put down because he was bleeding into his brain and these poems described everything I was going through. I cried the whole time I read them. But know I feel a bit better. You really helped me. Thank you. I have been riding Riley for 3 years and he has been for sale for over a month. He was sold and he's leaving the barn and leaving me forever, 800 miles apart. I'm going to miss him more than words can explain. Aww, hey Haddie! I've missed you on here. Thank you. I miss him but I know he is happy where he is. Hey Heartbeat, remember me? I'm so sorry for your loss. I'm also glad you're my sister in Christ and I'll be praying for you. Horses come and go but God and His Word are always there and He's the most important part of life. I know it must still hurt though. Glad you're a little better. Yes, this is a real horse. Thank you for all the sweet comments! I'm doing a little better now. Peppy has helped a lot and so have you guys! I miss him but I know he is in a better place now and I know he is looking down on me and Peppy watching over us. Love you guys! Like I said: I know how you feel, I've lost more than one horse in my life. But they are all happy in God's lush pastures forever! Was this a real horse? If so, I am so sorry for your loss. If not, well good story! OMG! That picture looks exactly like Tango. Thank you for posting it. It brought some tears to my eyes but a smile to my face. This is so sweet of you, to write a poem in his honor!